Most likely I will never visit Ladakh. The next best thing is to vicariously read about it in A Journey in Ladakh by Andrew Harvey. The book was first published in 1983. The paperback copy I read included an Afterword written in 1999. Harvey’s visit was in the summer 1979. Nearly four decades later, I suspect much has and has not changed in Ladakh, if I were to visit. This is because Ladakh, a region in the Himalayas in the Jammu and Kashmir State in northernmost India, is inaccessible for one-half of the year because of snow. But it’s more than just that. At the best of times, Ladakh is difficult and potentially dangerous to visit. Difficult because of limited access. It’s in the Himalayas. Dangerous because it’s proximity to Pakistan and Tibet, which means China. There’s a drawing of the Ladakh region in the book. I pour over the map reading such place names as Basgo, Go-Tsang, Purig, and Sankar. The map’s charm and exotic names, and mountain peaks and valleys, conjure images of another world. Which is exactly what we felt when my partner and I got as close to Ladakh during our last visit to India. Our few days in Shimla, and driving three hours north further into the foothills of the Himalayas, in Himachal Pradesh, gave us the privileged feeling of otherworldliness. 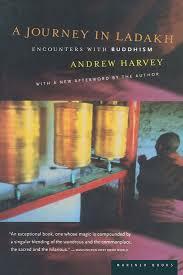 Harvey’s personal journey and his actual journey to Ladakh are inextricably interwoven throughout. A student from Oxford who is trying to find meaning in his life. The book’s journey is largely getting there, being there, and meeting a Buddhist Rinpoche (roughly speaking a spiritual leader or “precious one”).